The Mid-Autumn Festival this year is not until 9/25. 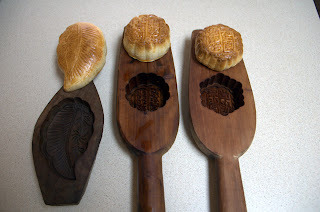 But I have been itching to make mooncakes since I bought several mooncake molds in an antique market in Shanghai back in 2005. 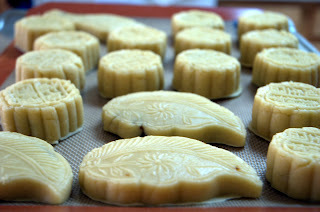 In my mind there are mainly two kinds of mooncakes -- the Cantonese kind and the SuZhou-style kind. A Cantonese mooncake has a very thin, tender, and buttery crust, and a very high filling-to-crust ratio. 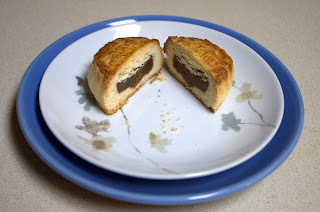 The other kind has the Chinese puff pastry style crust and is usually much smaller than the Cantonese kind. Well, according to Wikipedia, there is apparently a third kind popular in Taiwan, which uses shortbread-style dough for the crust. After much research into various recipes, I saw most of the Cantonese crusts require the use of lye water to treat the dough. I don't know...I have been brainwashed into thinking that using lye water is bad. 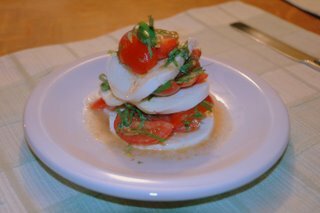 The Chinese style puff pastry is something I have always wanted to try. But alas, I am not about to use shortening, and I was not able to find rendered leaf lard at the Grand Army Plaza Green Market this weekend. This leaves me with the shortbread-style crust. The filling was easy -- I just bought a can of Xiang Lian Rong (湘蓮蓉) -- Lotus seed paste, which came already mixed with sugar and peanut oil. Other than that, the only things I needed that are out of an ordinary American kitchen are the molds and some dried milk powder. The result is a mooncake with much crumblier crust. It is almost like a butter cookie, except even more enriched with the milk powder. As my pastry skills still leave much to be desired, I think the filling-to-crust ratio was a bit high. But Mike agrees that these cakes are perfect with a cup of a English tea! Now all we need is the beautiful full moon and a pleasant company! 1. In a kitchen aid mixer with the whisk attachment, mix eggs with powdered sugar on medium speed for 10 minutes. 2. Meanwhile, sift first 3 ingredients together. Mix well. 3. Add melted butter to the egg-sugar mixture and incorporate well. 4. Switch the mixing tool to the paddle, and mix in the dry ingredients to the butter-egg-sugar mixture. Mix until even incorporated. Do not overmix! 5. 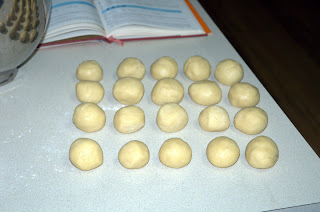 Dump the dough onto a working surface and divide into 20 portions. 6. Divide lotus seed paste into 20 portions as well. 7. 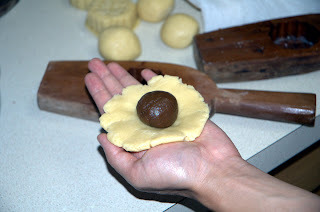 Press each dough portion into a flat disc and wrap it around one portion of the lotus seed paste. Slowly close it all the way around and form it into a ball. 8. Press it into a mold, and then bang the mold upside down on the working surface to unmold the pastry. 10. Bake at 400F for 25-30 minutes until the surfaces are golden brown. Let cool and serve. 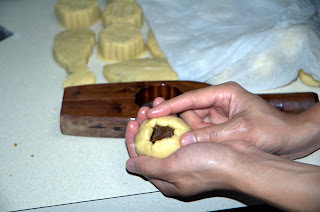 that said, i can't believe you actually made mooncakes from scratch! too bad i'm not in nyc to taste them. yes, the skin looks too thick, but i might actually like that better because the thick skin probably helps diluting the sweetness of the filling. i've never been a big fan of mooncakes because the filling is usually too sweet. oh when are you going to the u.s. open? make sure to take pictures and blog about it! Oh I went last Thursday! I saw Maria Sharapova won an easy match (very boring) and also James Blake vs. Fabrice Santoro. That match was very entertaining and it went 5 sets way past midnight. I also saw Colin Farrel sitting several rows behind us. It was nice. But Wimbledon is wayyyy classier.